It’s the wonderful week of Thanksgiving with family and friends joining us for what is my favorite holiday meal of the year. But we often forget to nourish ourselves in the frenzy of it all, I am guilty of that. I normally have meals in mind for dinner the week ahead, I realized this morning when plans changed for my day, that I really don’t have any meals planned other than Thanksgiving. So I took a look at what I have in the fridge and pantry, it works out I have everything I need for this meal. Although I’ll be replacing the zucchini with brussels sprouts, everything else will be the same. It’s a large enough meal for leftovers or feeding visitors. Enjoy yourself this week! Original: It was a simple Instagram photo by Dana Treat that sparked it all, and a recipe that comes from a beautiful cookbook by Cory Schreiber called, Wildwood, Cooking from the Source in the Pacific Northwest”. Although I adapted the vegetable part significantly, the recipe from the book is perfect and does not need altering at all. It is made with large portobello mushrooms instead of the medley I came up with, I had all of these vegetables, so I used them instead. I have the pleasure of knowing Cory over the last few years, and hearing stories from his life that are a part of this book make it all the better and quite amusing when I read them. This book is a peek into the history of this area. He and his family have owned restaurants and cooked here and on the coast for several decades. It is well written and tells the story behind Portland, the Oregon Coast and highlights Pacific Northwest cuisine. It’s a treasure full of stories and history. Easily a sit down and read kind of cookbook. It has been a cool for a few days, then it gets warm, then rain, then warm. 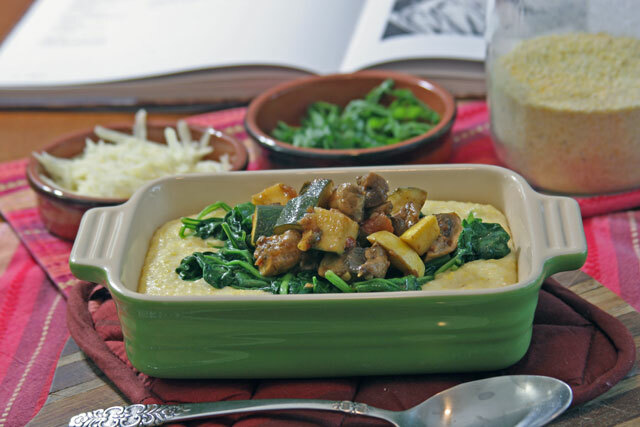 This day was cool, and rainy, perfect for a summer creamy polenta. This dish can be made all year long with a variety of seasonal vegetables, which is why I love it so much. Versatility is key for easy meals. I prepared this without meat for meatless Monday, but it can be tasty with a good chicken sausage or baked chicken thigh. 1. In a large pot or dutch oven, place the milk, water, and polenta. Cook over low heat for 30 minutes, whisking frequently. Stir in cheese, lemon, salt, and pepper. 1. While the polenta is cooking. In a large pan or skillet add the olive oil over medium low heat. Add the shallots/onions, saute for 5 minutes. Add the tomatoes, cook for 5 minutes to release the juices and caramelize. Add the squash, and mushrooms cook for 8 minutes. Deglaze the pan with the balsamic vinegar, scrape the brown bits bottom off the pan using a wooden spoon. Cook for another 5 minutes, then remove from heat. Add the basil, stir. 1. In a large skillet add the butter over medium heat, melt, then add the spinach. Cook for 5 minutes, just enough to wilt. Add the lemon juice and salt. Turn off heat. In a bowl, add the polenta, next add a scoop of spinach, then add a large portion of vegetables with some of the juices from the pan. Add a generous amount of fresh parsley and a sprinkle of cheese.